24 racers from 6 states converged in the town of Mahomet, IL on Saturday February 27th to do battle on the high banks of Sabatona Speedway for the CITRO G Jet 1000 title! Sabatona had gone through some recent tweaks and improvements to the track itself, and had just been upgraded to individual lane power. Although the system had been tested time and time again with simulated practice races, this would be the first actual race with the new timing system. Practice opened as scheduled at 10am sharp. Many racers eager to start practice arrived early and got some of the mingling out of the way while they awaited the track to open. Practice was set at 3 minute rotations so each racer would get equal practice time on each lane. The track was full for at least the first 2 hours of practice as the racers fine tuned their controllers and got familiar with the banks and overall fast pace and flow of Sabatona. There was lots of talk between drivers of about the banks, especially the main 55 degree, as well as the fast paced and skill needed to navigate the course. Practice started to thin around 12:30, so the track was shut down for qualifying preparation. As luck would have it, lunch was also ready, so all of the racers headed upstairs to the kitchen for some pulled pork sandwiches courtesy of Sandy. The racer list for the CITRO 1000 was a venerable “who’s who” of Midwest HO Racing, with special guest racers traveling from as far as California to contest for the win. The qualifying format would be a single heat race containing all 24 drivers in rotation. 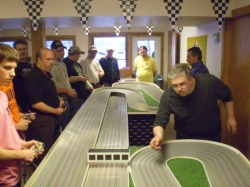 Drivers would race each of the 6 lanes for 2 ½ minutes using the specially prepared BSRT G Jet IROC cars. 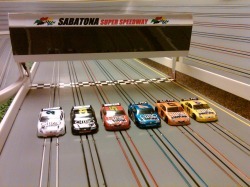 Each car featured a custom painted COT NASCAR body, courtesy of Mr. “Slot Pro” Jim Nagy. The timing method for the qualifying, and for the main event would be “Absolute time, race to the line, sit outs ok”. This method of timing eliminated the need to records sections, and all cars stop just after crossing the start/finish line. This made for quick and easy tire taping and pickup cleaning, and eliminated the confusion of having to swap cars into different lanes each heat. #1 Qualifier paired with #24 Qualifier, and a 9th-16th qualifier drawn at random. This pairing of racers would create an equal field of 8 teams, and would prove to create some interesting combinations, as well as confusion as to which team would actually win the event until the final heat was complete. Once the teams were set, the lane selection to start the main was offered to the teams in order of qualifier placement. Teams then gathered together to plan their strategy as to the running order for the team members in each of the 6 heats they would run. The Main Team event would consist of 6- 16 ½ minute heats. Heats would then be broken down into 3- 5 ½ segments, 1 for each of the 3 team drivers. There would be a 45 second pause between each segment for driver/marshal changes, and to tape tires and line up the cars. Rules stated that for each team currently racing, they would provide 1 of the team racers to marshal. This worked out great as there were always enough marshals, and this kept the race flowing well. The race started with most of the teams electing to start with their lowest qualifying racer. The pace was brisk, and the heats were relatively clean. It was obvious that this was going to be a race of speed and consistency, more than 2 or 3 outs in a heat, and you were going to loose ground to the other teams. 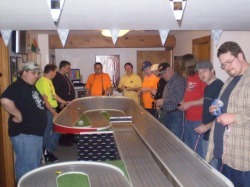 Since every team was comprised of racers ranging from top qualifiers to lesser accomplished drivers, it was immediately noticed that the teams that worked together and encouraged and coached their up and coming racers to have a personal best were going to be the teams to beat in the end. Having started in White lane for a straight through run, Team Len was the first team to finish all 6 heats in segment 18, and set the pace with a total lap count of 1119. Now the nail biting wait to see if this number would stand or fall would begin. Team Eric was next to finish strong after segment 21 of 24 with a total lap count of 1114, just 5 points behind the benchmark of Team Len. Team Len had dodged its 1st bullet, but the event was far from over. With the racing being so close, it was anyone’s guess at this stage as to what team would be the champion. During the event, there were some impressive segments of 68 laps each put in by drivers Steve Medanic, Charlie K, and Len. Close, door to door racing for 10-20 laps per segment by many racers was common, and even if your team was not in the race at the time, these shootouts proved to be entertaining and exciting to watch! I personally had several great battles with Terry Tustan. 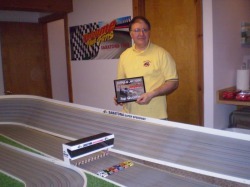 Terry, the original builder of Sabatona (then Cleveland International Speedway) in its original copper tape format showed that although he had not driven the track in at least 15 years, he still knew his was around the circuit! Great races were also had with Eric Eberman, Travis Joop, and Steve Medanic. It was so much fun racing hard with these great drivers that I sometimes found myself loosing track of the main objective, winning the team event! On to the 24th and final segment. With Teams Milt, Travis, Mike, Charley, Jaybo, and Steve still on the track, it was anyone’s guess as to the outcome as these teams rallied for a strong finish. As you can see, after over an hour of racing, and over 1000+ laps, the spacing of most teams was in the single digits! Extra Kudos to Team Milt for making a big push in the last several heats to move up and capture the 3rd position. After the race was over, regardless of what team you were on, or where your team finished, everyone had a smile on their faces, and were already talking about what a great time they had, and that “Next Time” things would be different! I think most were ready to do it all over again right then and there! Steve Medanic received the award for Top Qualifier. Congratulations Steve! Team Len with Galen and Bill D were then presented with their 1st Place Team Champion Plaques, and were each given their choice of cars as reward for their win. The remaining 3 IROC cars were then drawn for, and 3 lucky winners went home with a well broken in G Jet to add to their collection. Additional prizes donated by BSRT courtesy of local BSRT Dealer Chad Swim were drawn for and given out. Special thanks also to “Mr. 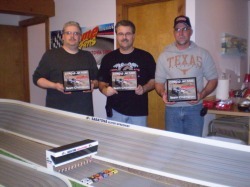 Slot Pro” Jim Nagy for donating the custom painted race bodies, box plaques, and race awards plaques. Jim continued to be a great asset to this sport and hobby both as a supplier, and supporter. Thanks also to my wife Sandy for the great food for the event, and for opening up our home for such a great event. Thanks also to our long distance travelers Eric Eberman, and Terry and Denny Tustan. If you missed the CITRO G Jet 1000 at Sabatona, you missed a GREAT race. Hopefully, we will see you at the next one. If I missed something, or you have your own story about the race, feel free to drop me an e-mail and I will add to the report. WATCH THE RACE VIDEO'S !!! !